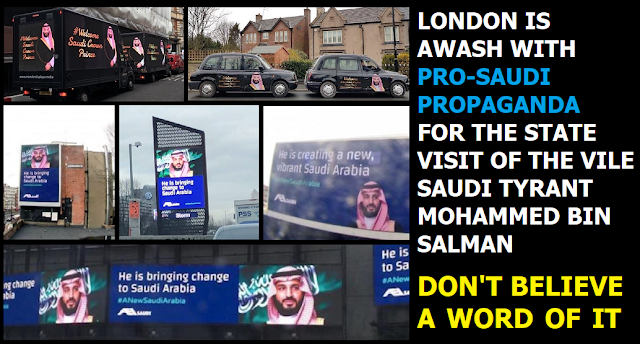 Just days after the blinkered Tory propagandist Tim Montgomerie accused Jeremy Corbyn of being "an apologist for terror" Theresa May and the Tories are welcoming the Saudi tyrant Mohammed Bin Salman to Britain for a state visit. Who cares that the Saudi tyrants have been spreading terrorism across the Middle East and the world for decades? 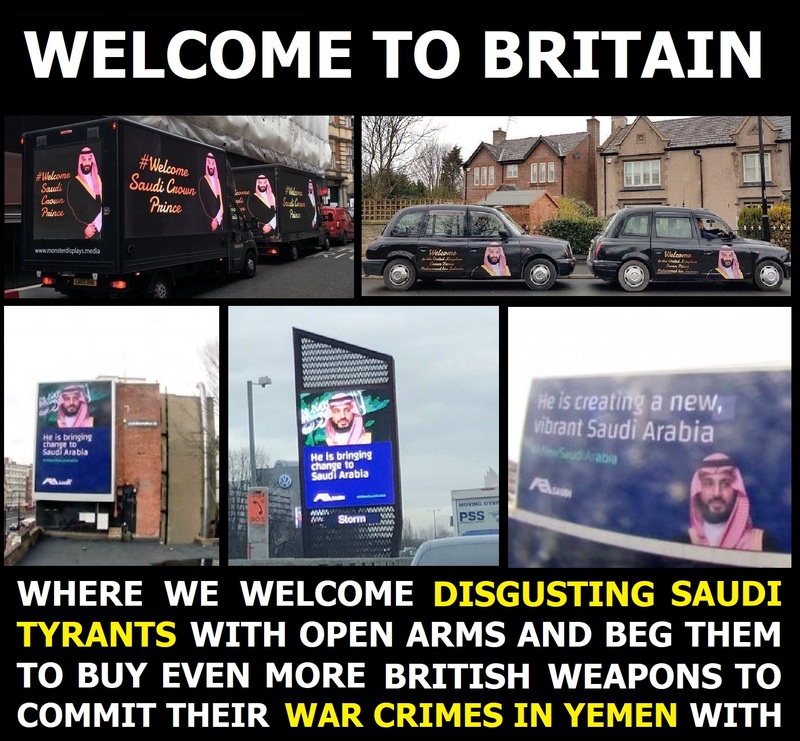 Obviously not the Tories, because they're just as aware as the Americans that Saudi Arabia is one of the main sources of arms, fighters, and funding for ISIS, yet they've rolled out the red carpet for them. Who cares that the Saudi tyrants have been committing outrageous war crimes in Yemen for the past three years? 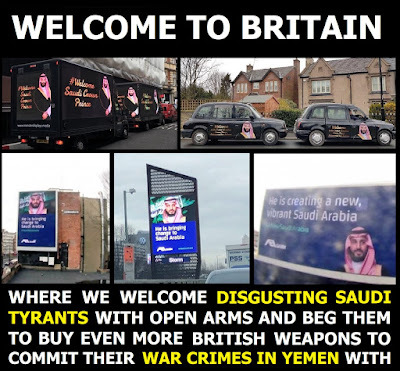 Obviously not the Tories, because they're intent on ensuring that the Saudis continue to use British-made weapons to commit these war crimes because, as Boris Johnson told parliament last year, if we didn't sell them weapons, someone else would. Who cares that Saudi Arabia is one of the most disgusting tyrannies on earth where people are sentenced to death by beheading or crucifixion for "crimes" such as atheism, homosexuality, and attending pro-democracy protests. Obviously not the Tories, because in 2012 the Tories cobbled together a secret deal with these vile human rights abusing Saudi tyrants to vote them onto the United Nations' Human Rights Council! So today Theresa May is welcoming the Saudi tyrant Mohammed Bin Salman to London, and she's offering up as many bribes and favours as she can muster in order to beg for some more of their oil cash. To mark the occasion London is adorned with the kind of grotesque personality cult propaganda that is more akin to something you'd see in a Middle Eastern dictatorship or North Korea, than the capital of a major European city (see image). Apparently the purpose of Bin Salman's visit is to cherry pick a selection of British companies to acquire for Saudi Arabia. Who would have thought that "taking back control" would involve our government begging Saudi tyrants to prop up our faltering economy with their oil cash, and allowing them to buy up a load of British companies. What absolute brass neck the Tories have got to slur their political opponents as supporters of terrorism and tyranny when they're literally grovelling at the feet of Islamist tyrants from Saudi Arabia. Labour have pledged to stop arms sales to countries like Saudi Arabia that brutally repress their own people, arm and fund terrorists, and commit genocide and war crimes against their neighbours, yet the Saudi-grovelling Tories accuse Labour of what they're guilty of themselves. But then accusing your opponents of what you're actually guilty of yourself has always been one of the most distinctive extreme-right propaganda tactics. This kind of reality-reversing propaganda works in two main ways. It's sufficient in its own right to convince those who are naive enough to mindlessly rote learn their opinions from the mainstream media, but it also creates confusion amongst others by creating a reverse reality to compete with the observable facts and evidence. If they can't convince us to believe in their reality-reversed propaganda, then they're hellbent on gaslighting us so much that we begin to doubt our own sanity. Thus the Saudi tyrants with jails full of atheists, pro-democracy protesters, and homosexuals awaiting execution are cast as kind and benevolent reformers to be welcomed with open arms ... and the political party that are sucking up to these brutal wonderful Saudi tyrants benefactors, and are propped up by a bunch of sectarian terrorist-backed bigots from Northern Ireland, continually accuse their political opponents of supporting tyranny and terrorism!